I n the world of boating, boat owners use marine engines to power their watercrafts. However, the brand of the marine engine they use varies on what their needs and wants are. Whether it’s a small or a big boat, an outboard marine engine has the capability to propel it, but their features and advantages vary on the company that manufactured it. While there are currently a wide selection of marine outboards available in the market, Yamaha is considered as one of the best in the industry, which is why you should consider getting one for your boat. To try and convince you further, here are 4 simple reasons why you should buy a Yamaha marine engine for your watercraft. The average Joe may think that the name Yamaha is only big in the world of motorcycling, but boat owners know better than that. 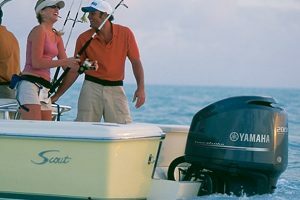 In fact, Yamaha is known for manufacturing outboard marine engines that are durable, reliable, and powerful. The company’s other products include scooters, motorcycles, snowmobiles, automobile engines, fishing boats, and so much more. The brand Yamaha itself is very popular all over the world, and it has been so for more than five decades, so you can expect that a marine engine carrying its name will meet or exceed your expectations. Reliability is one of the things that boat owners always look for in an outboard marine engine, and Yamaha doesn’t disappoint in that area. For a recreational hobby such as boating, the importance of outfitting your watercraft with a reliable engine should never be downplayed, because its reliability is the only factor keeping you from getting stuck in the middle of the open waters. That also applies to fishermen who use outboard engines to power their boats, because they need a dependable outboard motor that will be able to withstand the wear and tear of regular usage. Of course the chances of that happening are very low, especially if you’re regularly cleaning and maintaining your outboard engine, but the risk of you getting stuck is significantly lowered with a Yamaha outboard motor. Also, Yamaha outboard engines are built to last, so expect that it will work nicely throughout the years. That is, of course, if you give it the regular cleaning and maintenance it needs. 2-stroke and 4-stroke are the usual varieties of outboard engines, and each one of them offers their own set of advantages and disadvantages to boat owners. While there are many companies that manufacture 4-stroke engines, Yamaha is among the few that manufactures both 2-stroke and 4-stroke engines, giving boat owners a lot of choices for their boating needs. Yamaha outboards tend to pack more horsepower than other leading brands in the industry, which is why it is the preferred outboard marine engine of boat owners who are looking for something powerful. Aside from that, Yamaha outboards are slightly less noisy than other leading marine engines. This feature is very impressive considering that Yamaha outboards are known for their sheer power.